← Life not going your way? Read this now! Searching for a CPR and/or First Aid Certification Class? Look no further! Spiritual Spectra’s next Wellness Talk Series is a CPR/AED (Automated External Defibrillator) & First Aid Certification Class taught by Lynn Eglseder of CPR with Confidence, LLC. We will be offering the Heartsaver CPR and First Aid program – a certified class that will demonstrate how to deal with Adult, Child, and Infant CPR/AED, choking, and basic First Aid. This class is helpful for day care providers, personal trainers, and health coaches who need it for their license or are interested in adding a boost of safety to their expertise. This class is also helpful for new parents and caretakers of those with heart illnesses or elderly loved ones. The cost for the 5 hour certification class is $70, this is a SPECIAL DISCOUNTED RATE that Lynn is offering ONLY to those who sign up for Spiritual Spectra’s class offering (the cost often ranges between $80-105). The 5 hour certification class will be split into two days – Monday from 5pm-8pm will cover CPR and Wednesday from 5pm-7pm will cover First Aid. Participation on both days is required for certification. For individuals who are looking to have a general knowledge of CPR to care for family and friends, you can sign up for the Monday 3 hour CPR class only for $30. Those attending only on Monday WILL NOT BE CERTIFIED. Don’t wait! There are only 6 seats still available so be sure to act fast! Advance registration is required; email us at info@SpiritualSpectra.com to register for the course. Please include your name, business name, phone, email address, type of license and license number (for individuals who do not need this class for their business license, business name and license number are not necessary). You will be emailed how to pay. Questions? Contact us at info@SpiritualSpectra.com or 1-888-934-3642 (toll-free). 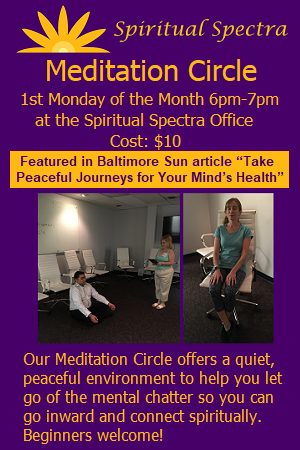 Visit our website http://SpiritualSpectra.com for information about this and other upcoming events.